The green needles of larch trees turn brownish-orange and fall to the ground. Cherskiy, Russia. Climate change is impacting Arctic regions at twice the rate as the rest of the globe and as a result, ecosystems in these regions are seeing an increase in frequency, intensity and severity of fires in many boreal forests. The primary objective of this research is to delineate the causes of varying post-fire tree regrowth within larch forests of eastern Siberia and determine consequences for climate feedbacks through changes in Carbon storage and albedo (light radiation). The team will be using a combination of field-based measurements, dendrochronological analysis, remotely-sensed data, and statistical modelling. 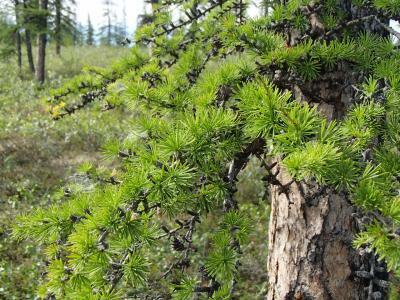 The research will increase the understanding of how larch forests in the Arctic of Siberia respond to a changing fire regime and particularly identify the mechanisms of response. 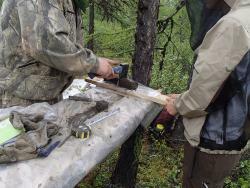 Dr. Valentin Spektor of the Melnikov Permafrost Institute in Yakutsk, Russia, splits a permafrost core for bagging and later analyses. Cherskiy, Russia. Research will focus on larch forests in two regions of the Russian Far East: Cherskii and Yakutsk. While in Cherskii, they will primarily stay at the Northeastern Science Station where dorm-style rooms and meals are provided. They will also travel for one week down river on a barge. Dr. DeMarco is a faculty member in the School of Environment and Sustainability at Western Colorado University where she teaches courses in the science of environmental management, climate change, and data management. Her research focuses on how climate change, land use change, and invasive species impact how carbon and nutrients are cycled in terrestrial ecosystems. She received her B.S. in Environmental Science at Northern Arizona University and her Ph.D in Ecosystem Ecology at the University of Florida. Following graduate school, she completed a postdoc at New Mexico State University and then was an adjunct professor at University of Florida before moving to Gunnison just a year ago to teach at Western. She has conducted research in a range of ecosystems including the Sonoran and Chihuahuan Deserts and the arctic tundra. Last summer she journeyed to Siberia for the first time to begin research investigating recruitment of Larch trees following fire. I am incredibly excited to learn new content that I can bring back to the classroom! Thank you for sharing all your advice and expertise Mark :). Thank you for sharing wonderful Tundra resources! I cannot wait to bring them back to the classroom! I cannot wait to start implementing some of your amazing lesson ideas for young learners! Thank you for sharing your adventure :).